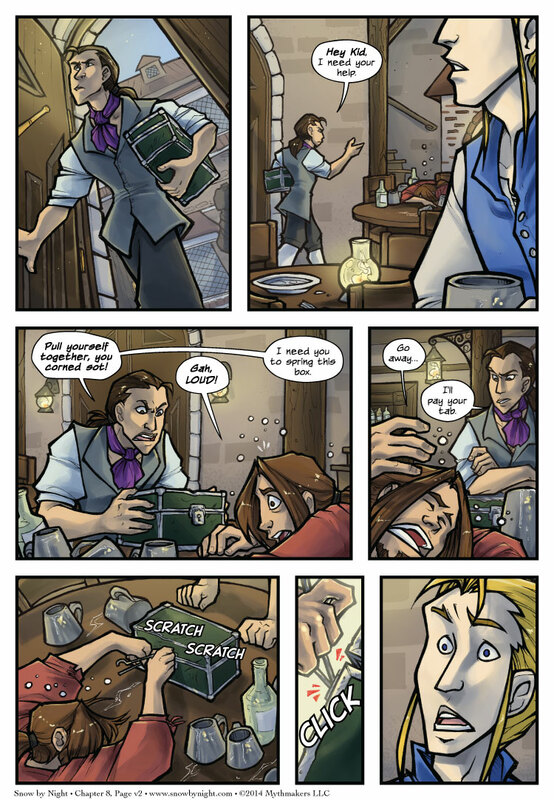 The man with the purple cravat makes his appearance on Birds of a Feather Page 2. Did you think we were done with him? Ha ha. He’ll be around for a while. To see how the first meeting between Laurent and Jassart goes, please vote for Snow by Night on Top Web Comics. The first round of our Art Contest is done. My thanks to all the Elite 8 submissions, and congratulations to Laura Chilson, Amasugiru, Monica Marier, and Rein Eire who are moving on to the next round. We’re starting the Final 4 round today. You can vote once a day. Well, now we know why Jassart became partners-in-crime with Blaise. Guy can pick a lock while three sheets to the wind. Right? What other credentials could possibly be higher on the list?! I didn’t read the description from yesterday, so it only now occurred to me that this was Shazzbaa doing the lines. I have to say, it’s nice to see some more of her work!